The ‘language of stones’ allowed a sentimental message such as "LOVE" to be conveyed using the initial letter of each stone in the design. Here, the pendant has the stones of Lapis Lazuli, glass in imitation of Opal, Vermeil ( the old name for garnet ) and Emerald which spell love. Jewels with portraits or symbols of love, such as butterflies, doves and cupids, were very popular. 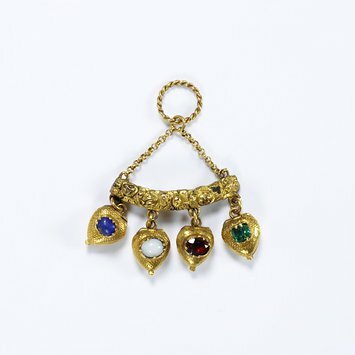 Pendant, gold set with lapis lazuli, glass in imitation of opal, vermeil (an old name for garnet), emerald, gold. These stones spell LOVE.